I made a large batch of these little goodness for tomorrow's hot pot dinner! Invited lots of friends over and gonna get busy tomorrow, wrapping dumpling, making the tom yum soup base and all, so I better make this ahead of time and have them chilled well in the fridge. Just for the sake of blogging, I tried one of them. I love it! This jelly cups reminds me a lot of my mum. She got all excited when she bought this soya bean maker and made tau foo fah and this soya bean cups at least once every fortnight. Probably now, she found new things that interest her and as far as I remember, the soya bean maker is placed right on top of the fridge and left to rot! Anyway, having studied abroad, I learnt one thing and that is to want to eat your own favourite food and have cravings all the time is to learn to make it yourself! Your mum is not here! I wanted to adapt the recipe from Hijack Queen but god knows what went wrong and I modified the recipe so much that I could call it Quinn's recipe now. However, Hijack Queen's post had been a good guide though and I love her photographing skills! 1) Bring Portion A to boil over low heat. 2) Mix Portion B together in a large salad bowl. 3) Pour hot Portion A into Portion B and mix well. 4) Ladle into individual serving cups or bowl. 5) Drop two longans in each cups and chill at room temperature until partially set. 6) Transferred into fridge and chill well before serving at least for a couple of hours. 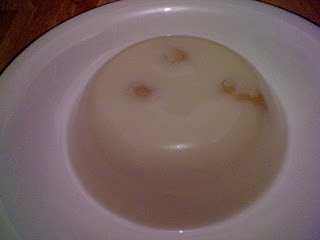 7 comments on "Soya de Longan Jelly"
Ah, finally you make the jelly. Isn't it a waste to drained the lychee syrup? If I were you, I will substitute a cup of water with the syrup and reduce the sugar again. Lots of trial and error. lol. But yours definitely looks nice. Hey....thanks for the suggestion. Really shouldn't have thrown the syrup....will cut down sugar and replace with syrup. I receive ravings about it. 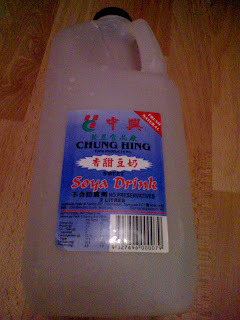 So refreshing after a heavy tom yam hot pot dinner. Yeah I agree, really lots of trial and error. I'm glad I found your recipe as a guideline, thanks again! 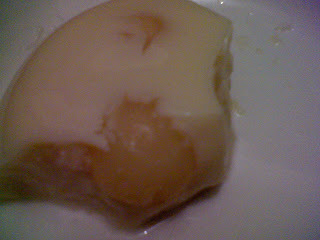 Wow..this sure look great to me... :) Quinn, does this taste sort of like the Almond Longan Jelly.....? Hi, i wanna ask, whats the difference between the jelly powder and the jelly strips? They are the same thing in the end. Jelly strips, you need to soak it in water before using else you'll find it hard to dissolve. Jelly strips and jelly powder are almost analogous to gelatine leaves and gelatine powder. Thank you very much for the explanation! And I enjoy your blog a lot, God Bless!